This recall involves Luxe Satin children’s long-sleeve robes. 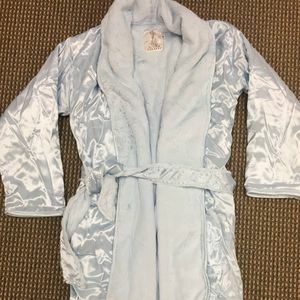 The robes are 43 percent acetate with 57 percent rayon, satin outer shell and a 100 percent polyester microfiber inside. The robes were sold in pink, blue and cream in sizes 1 (XS-S/4-6 years), 2 (MD-LG/6-8 years) and 3 (XL-XXL/8-10 years). The robes have two belt loops on each side and an unattached belt. Lot number “21706-DFR001” and “Not Intended for Sleepwear” are printed on the robes inside seam label. Children’s specialty stores nationwide and online at www.littlegiraffe.com from November 2012 through March 2017 for about $100. Little Giraffe toll-free at 866-201-6613 from 10 a.m. to 4 p.m. PT Monday through Friday or online at www.littlegiraffe.com and click on “Recall Information” at the bottom of the page for more information.